The Scrambler range consists of the Icon, Cafe Racer, Full Throttle and Desert Sled. Of this the Icon, Desert Sled and Cafe Racer will launch now, Full Throttle to come later this year. The new bikes get cosmetic and feature updates, new suspension and cornering ABS. They are expected to cost around Rs 60,000 more than their previous iterations. 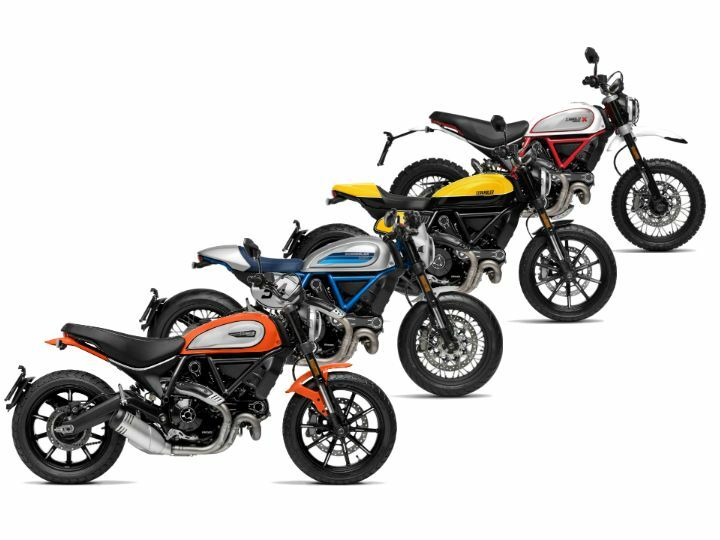 Ducati is set to launch the MY 2019 Scrambler range on April 26. The new International range consists of the Icon, Cafe Racer, Full Throttle and Desert Sled. Of these, the Icon, Cafe Racer and Desert Sled will launch now while the Full Throttle will come later this year. For 2019, the Scrambler range gets a lot of updates over the previous one. We recently rode the updated Icon in Thailand and you can read about how the changes have affected the bike in the link below. The bikes retain the same signature Scrambler styling but get minor cosmetic updates, like a new headlamp that gets an ‘X’ logo integrated into the lens. You get machined finished alloy wheels and cylinder head fins. The fuel tank gets swappable aluminium side panels that can be customised as per your taste. New features include LED turn indicators, optional Ducati Multimedia System, and adjustable levers. You also get a new instrument console that now includes a gear position indicator and a fuel gauge. While not much has changed in the powertrain department, the Scrambler range gets a new hydraulic clutch that should reduce clutch lever effort by quite a bit. The bikes continue to be powered by an 803cc air-cooled L-twin motor that makes 74PS and 67Nm of torque. It gets a six-speed gearbox with a slipper clutch. The biggest addition is to safety which comes in the form of a new Bosch Cornering ABS. This setup helps keep the bike stable in corners under hard braking. Going by the updates, we expect the new Scrambler range to cost Rs 60,000 more than the previous range which start at Rs 6.78 lakh (ex-showroom, Delhi). Stay tuned for launch updates.